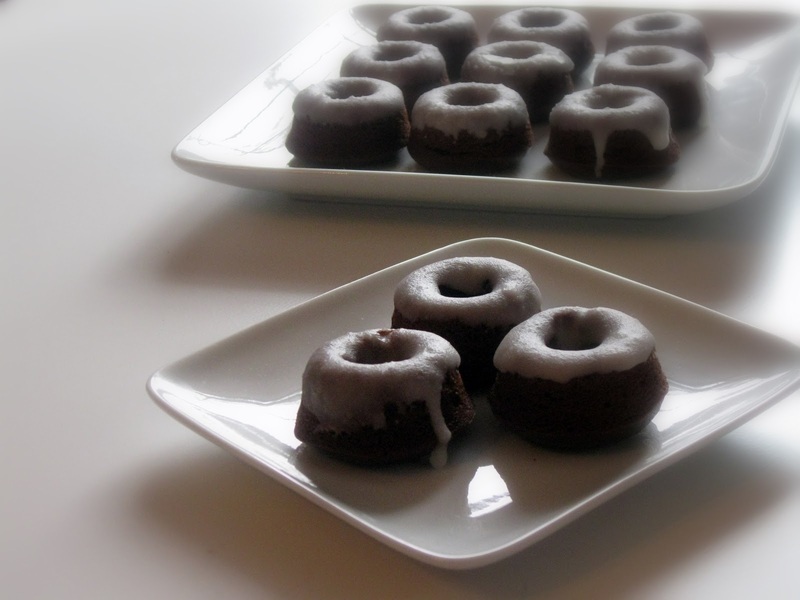 I received a mini doughnut pan for Christmas which I am super excited about. I already had recipes bookmarked for when I did obtain a doughnut pan then hoped someone would purchase it for me for Christmas. So, when I opened it I definitely squealed a little bit. The pan makes 12 2" doughnuts which are a perfect size to me because then I get to have three instead of one and I feel like I'm splurging. Now, the problem you see is that this recipe made about 30 and I ended eating about 9 because they are so good. I tried them without the glaze but I definitely like them with the glaze better. Although, I wouldn't not eat the non-glazed ones, of course. I mean lets not be silly here. But if you're having over a group of people then they would be a lovely accompaniment to a breakfast or brunch. I'm definitely going to be trying several flavors in the near future to see which ones I like the best. These are double chocolate because they have chocolate chips (although they are melted) and cocoa powder. Two chocolates are always better than one. 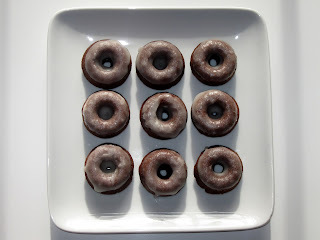 A doughnut pan is definitely needed though for these because the batter does not hold its shape. I actually used a piping bag to pipe the batter. Place the bag with the top edges folded over in a drinking glass. Be sure to fold the bottom like in the picture below so that none of the batter will leak. You can also put a zip-top bag in a glass with the top folded, then just cut off the tip once you have filled the bag. This method is helpful if you don't have anyone to hold the bag or want the tip folded so you don't have to worry about it running out of the opening. The glass is also helpful for holding the bag once it has been filled such as between batches if you don't have enough pans to do it all at once. With the bag in the cup you don't have to worry about it running out of the opening or the bag as long as you keep the top twisted. Hopefully those with help with any piping. I use them a lot even with small parchment bags for filling them. This post is also part of a linky on Inside BruCrew Life. 1. Preheat oven to 350°F. Coat doughnut pan with cooking spray. 2. Whisk together flour, sugar, cocoa powder, baking powder, and salt in large bowl. 3. Combine milk, chocolate chips, butter, and vinegar in saucepan, and warm until chocolate and butter are melted. Cool. Whisk liquid eggs with 2 Tbs. water in small bowl; whisk this mixture and vanilla extract into milk mixture. Stir milk mixture into flour mixture. 4. Fill each doughnut mold half full with batter. 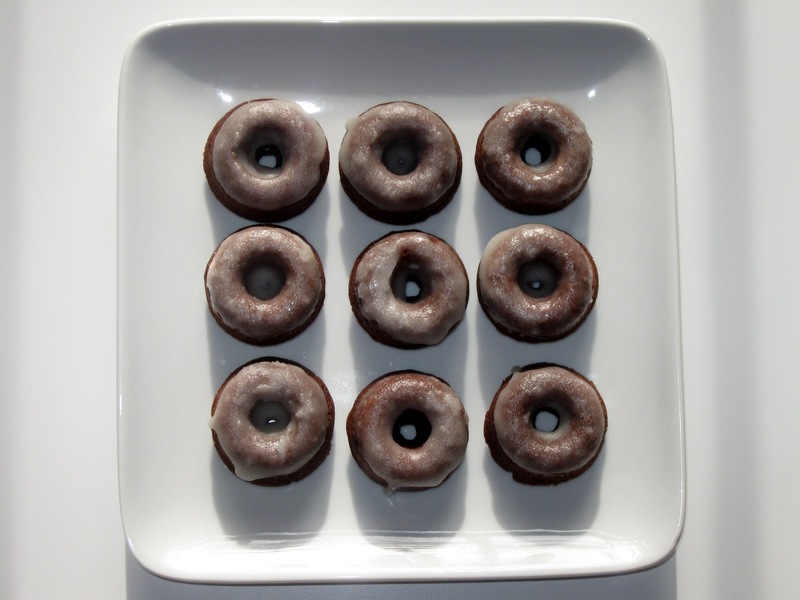 Bake 12 minutes, or until toothpick comes out clean and Doughnuts spring back when pressed. Transfer Doughnuts to wire rack to cool, and repeat with remaining batter. 1. Combine confectioners’ sugar and milk in saucepan, and bring to a simmer, whisking constantly. Remove from heat, and cool 5 to 10 minutes, or until thickened. Stir in vanilla. 2. Dip each doughnut into Glaze. Let Glaze set before serving. I totally agree with you...two chocolates are better than one:-) Thank you so much for linking up to Trick or Treat Tuesdays. I can't wait to see what you bring this week.